AbcSubmit makes it easy to create secure online order forms, highly customizable and simple to edit using our drawing mode, so your customers will be placing orders in no time and they will love your forms. It’s a great way to collect payments securely and to create invoices online. Need an efficient way to sell through professional sales order forms templates? We think that a form builder should provide professional order forms for your products, so we created a product field and a shop field to cover all your business needs. You can empower your forms with E-Commerce solutions or you can transform your customer order form in a real online store in minutes. Creating food order forms or fundraiser order form template could take some of your time and would require programming and design experience. But there is an easier way to get the job done, it’s a kid job to create forms using AbcSubmit, while also improving your online presence. Use our Drag ‘n Drop feature to add the fields you want on your form, and even customize it with your company’s colors and branding. Publish your free order form template on any platform like Weebly, WordPress, Wix, Squarespace and so on. 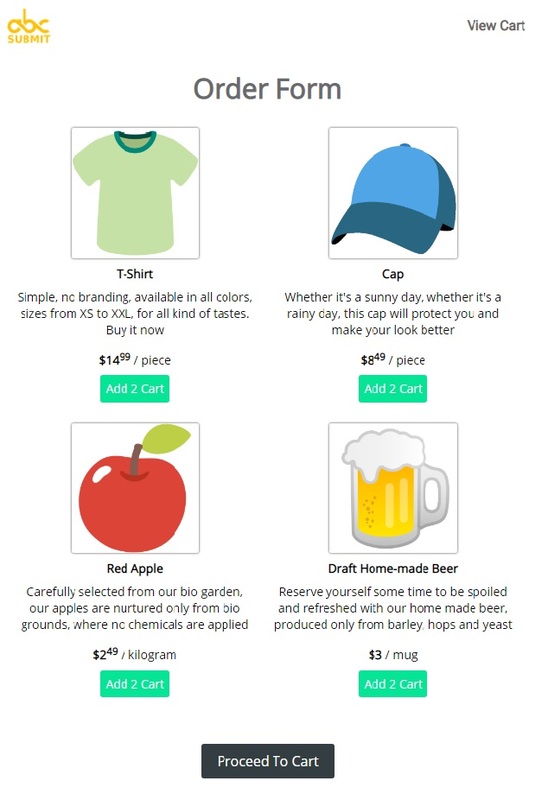 By adding the shop field to your t-shirt order form or clothing order form template you can let your customers modify the quantity of each item, add products to a real shopping cart, preview and manage cart items. Such an order form online template includes all you need to start selling your products online right now. Become an entrepreneur today using our E-Commerce solutions through your online forms. If you want to accept online payments for orders through your sales order form, this is the place to be. Start today your online business and accept credit card payments. You can add multiple payment processors to your website order form and let your customer choose which is the best fit for them. Your credit card order form can be integrated with the most popular payment processors on the market like Stripe, Paypal, Braintree or accept payments with Square. Flux is our workflow tool which can be used both for product order forms and online store orders. Add multiple notifications for you, your team and your customers and customize email templates to match with your niche. Create advanced notification rules for multiple recipients, send approval email for your orders and set actions for abandoned checkouts from one single interface. Everything is customizable on AbcSubmit form builder. No matter you are using ready to use order form templates or create your online form from scratch, AbcSubmit gives you a lot of tools to customize your design and theme. Yes! It’s true, we can offer real eCommerce solutions, with a real online shop for your products. By using AbcSubmit you can create an online shop, import your products or manually add them and start to accept orders and get paid online. Easily add discounts and taxes for your checkout and show them all in your shopping cart. Create free custom order form templates, job application form, survey or booking form using our free form templates or you can show us some art by creating your form from scratch. No matter what information you need, whether it’s applications, order details, or feedback, we’ve got you covered. Customize any template to suit your specific needs with our drag and drop order form builder. You can host your websites or forms either using your own domain or using a [yoursubdomain].abcsubmit.com domain you choose. Hurry up in order to reserve your free hosted domain. Your data is always stored encrypted in our databases on the cloud, so you can focus on your business without being worried. You can always upgrade or downgrade, depending on your needs. Use your Google Drive to see results and generate graphs. Start creating your professional order forms today!